Please be informed that the venue of the 13th Philippine Sudoku Super Challenge shall be on the 4th floor, SM Sta. Mesa on Saturday, November 24, 2018. Due to the narrow space of the venue, the contest will come in two batches. Grandmaster, Under 15 and Under 12 categories. The registration starts at 8:00 AM while the contest proper begins at 9:00 AM. *The first batch participants should use the entrance gate which is just in front of Anytime Fitness near BDO Building. The registration starts at 11:00 AM and the contest proper starts at 12:30 PM. All participants must bring any valid ID and Birth Certificate so that the correct category shall be assigned to all the national finalists of the 13th Philippine Sudoku Super Challenge. This entry was posted in Announcements, Event Articles, News article on November 19, 2018 by admin. This entry was posted in Announcements, Event Articles, News article on November 16, 2018 by admin. 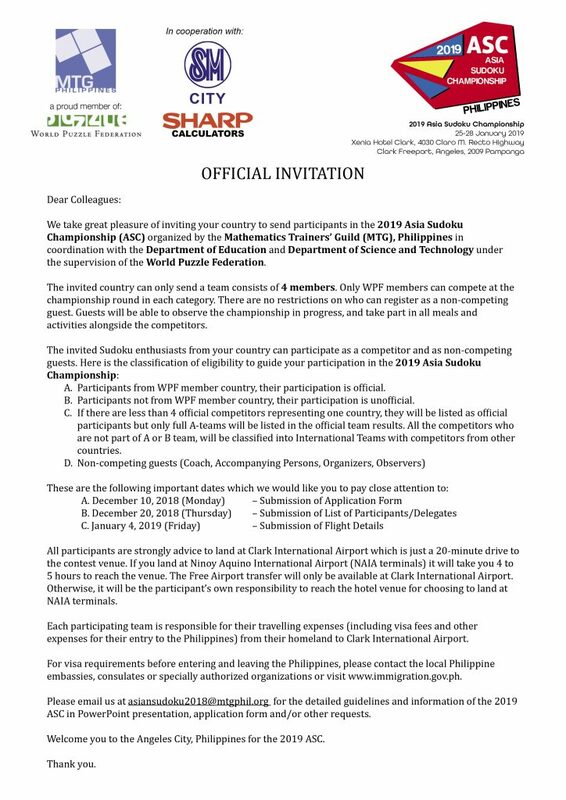 Please be informed that as per recommendation from the World Puzzle Federation (WPF) of which the MTG Philippines is a member, all Under 18 participants of the 13th Philippine Sudoku Super Challenge national finals will be split into two divisions: Under 15 (13-15yrs old) Division and Over 15 years old. All other participants over 15 will join the Grandmaster Division. This new format in classifying the age category is in accordance to and in preparation for the 2019 Asia Sudoku Championship which will be held in Philippines in January next year. In line with this, may we request all participants of Under 18 category to send us a scanned documents of your proof of birth on or before November 15, 2018 at this email address: pinoysudoku@mtgphil.org. This entry was posted in Announcements, Event Articles, News article on November 11, 2018 by admin. 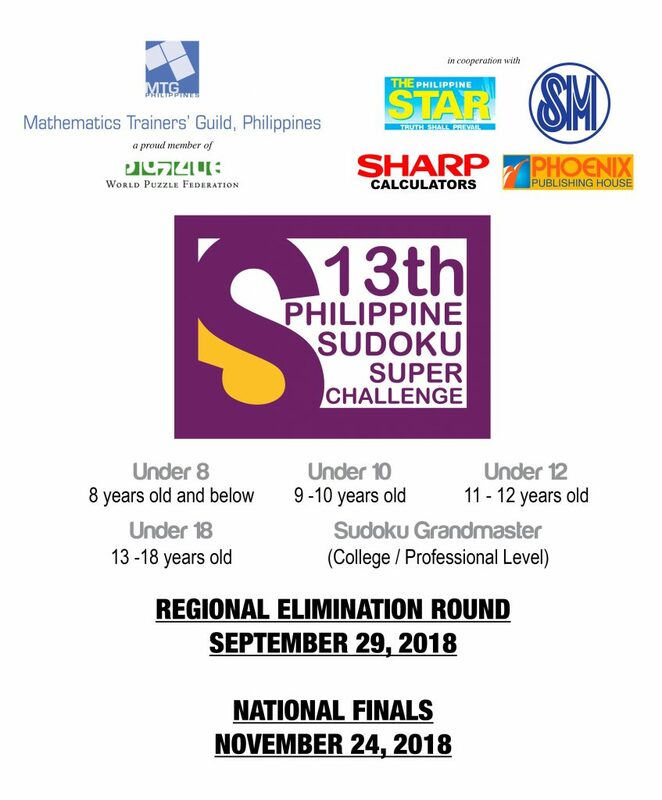 Please be informed that the 13th Philippine Sudoku Super Challenge National Finals will be at SM City Sta. Mesa located at R. Magsaysay cor. G Araneta Ave, Dona Imelda, Quezon City on Saturday, November 24, 2018. The participants are advised to proceed to the venue early because the registration starts at 7 AM while the contest at 8 AM. 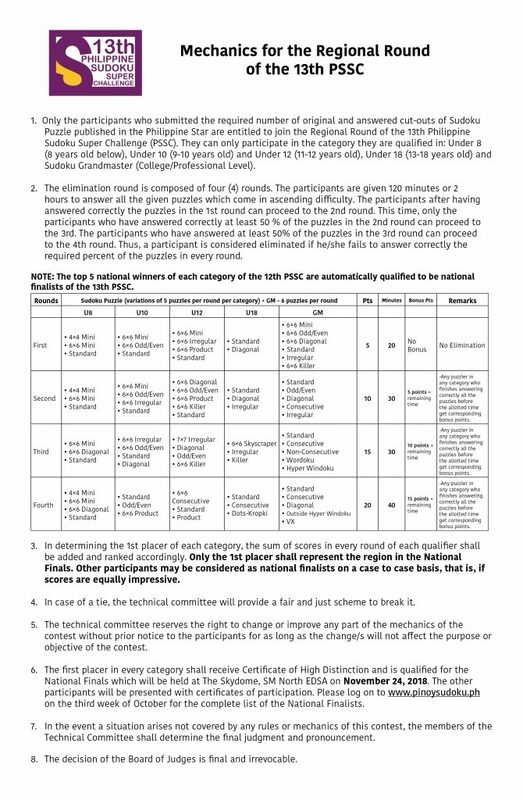 The format of the 13th PSSC has been changed to meet up the latest Sudoku competition standard in the international arena. 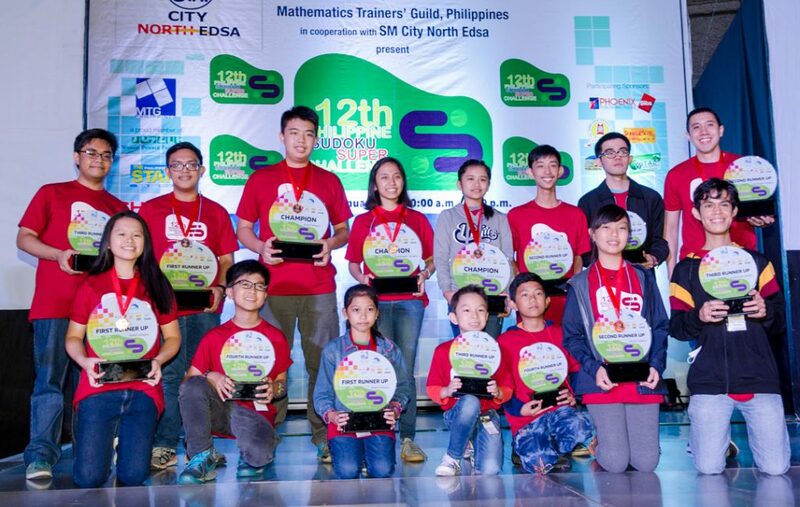 Thus, the national finalists who are winners of the respective regions will vie for the major titles under the following categories: Under 8 (8 years old below), Under 10 (9-10 years old) and Under 12(11-12 years old), Under 18 (13-18 years old) and Sudoku Grandmaster (College/Professional Level). This entry was posted in Announcements, Event Articles, News article on November 6, 2018 by admin. This entry was posted in Announcements, Event Articles, News article on September 22, 2018 by admin. This entry was posted in Announcements, Event Articles, News article on September 14, 2018 by admin. Candice Renee Beatrice Solidarios, of the University of the Philippines (UP) Rural High School in Bay, Laguna won as the Philippines’ Sudoku Grand Master as she was declared champion in the Grand Master Category during the 12th Philippine Sudoku Super Challenge (PSSC) national finals held at Skydome, SM North EDSA, Quezon City last January 27, 2018. Besides Solidarios who received P60,000 for her feat, others who won in the Grand Master category are: Errol John Suarez of University of Santo Tomas-Legazpi, first runner-up with P40,000; Alec Pius Machacon of AXA, second runner-up with P20,000; Ralph Joshua Sarrosa, third runner-up; and Sed Anderson Holaysan of Lexmark, fourth runner-up. Meanwhile, Jonathan Conrad Yu, of the Philippine Christian Gospel School in Cebu City won as champion and received P50,000 in the Wizard Category for high school students. Declared as first runner-up with P30,000 prize was Kirsten Dominique Chan of Bayanihan Institute. She was followed by John Joseph Gabata of Dr. Yanga’s Colleges, second runner-up who got P20,000; Jan Vincent Simbol of De La Salle University Integrated School, third runner-up; and Marc Kendrick Lim of Parada National High School, fourth runner-up. Equally reaping honors for herself was Louisa Jean Cabugao of Akle Elementary School in Bulacan who won as champion and received P20, 000 in the Whiz Kid Category for elementary students. Rounding up the winners’ circle are: Angela Mae Gabriel of Sabang Elementary School, first runner-up with P10,000; Hailey Leanne Chu of Hua Siong College of Iloilo, second runner-up with P5,000; Matthew Kenzie Rasines of Philippine Christian Gospel School, third runner-up; and Jether Baroman of Tambo Central School, fourth runner-up. A total of 151 students competed in this year’s PSSC national finals: Grand Master Category (30), Wizard Category (82), and Whiz Kid Category (39). This year’s PSSC was made possible by the following co-organizers SM North EDSA, The Skydome, SHARP Calculators and Philippine Star and by the following sponsors: Phoenix Publishing House, SIB Publishing House, David’s Tea House, Royal Garden Restaurant, Vital 1 Purified Drinking Water and Zamboanga Today. This entry was posted in Announcements, Event Articles, News article on February 4, 2018 by admin.